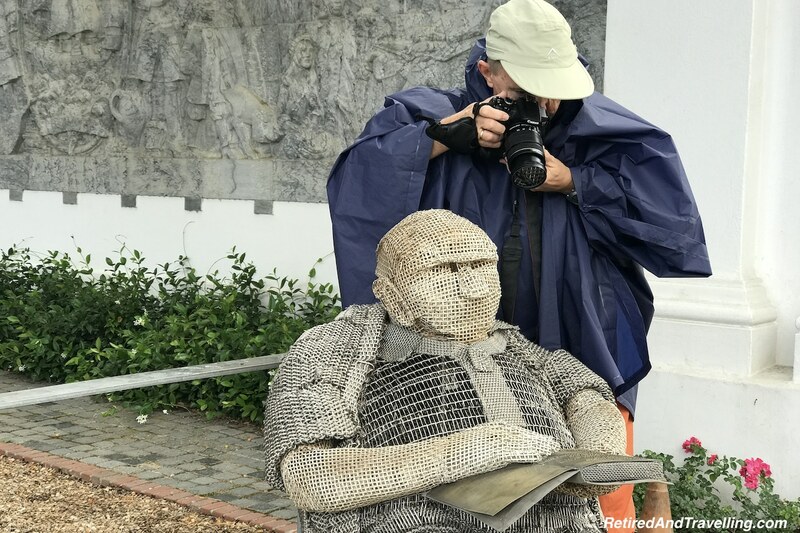 It was our second day trip during our 10 days in Cape Town. 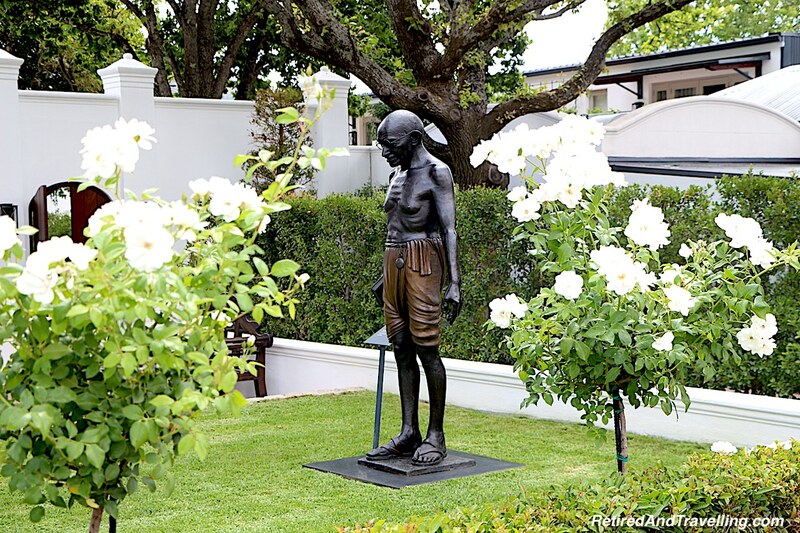 After having enjoyed a quick tour of the city of Cape Town, it was time to head out to the countryside. 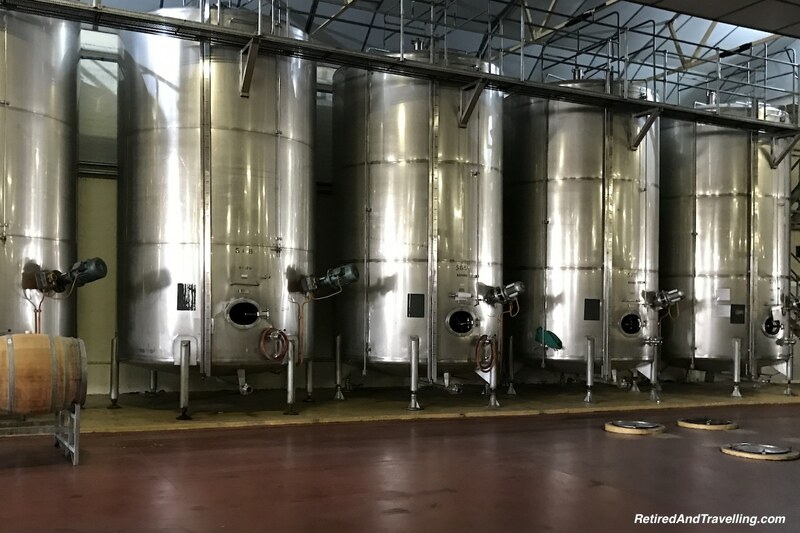 We always visit wineries when we travel in Italy and in the south of France. 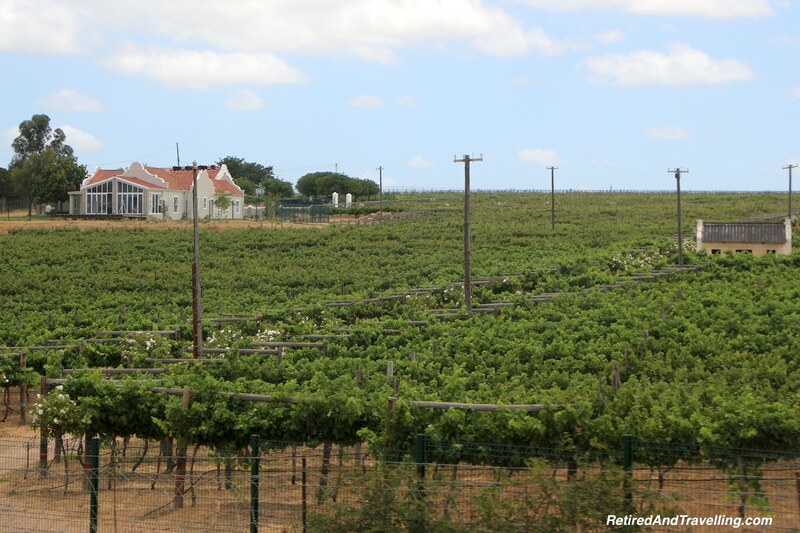 Cape Town is known for its award winning wineries. 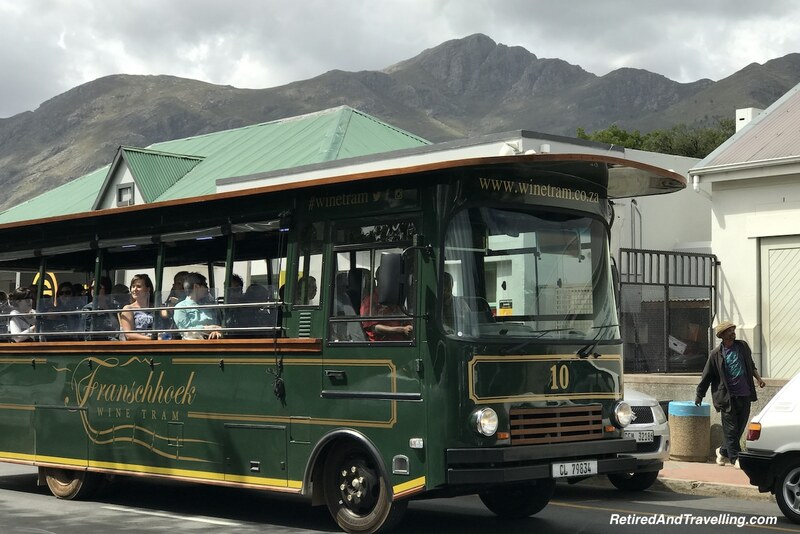 We couldn’t pass on a wine tour in Stellenbosch. We were lucky to have the same tour guide for 3 days. Rod continued to provide detailed information as the bus drove out of the city. We passed the hospital where the first heart transplant was done in 1967. He talked about the infamous “District 6” area. 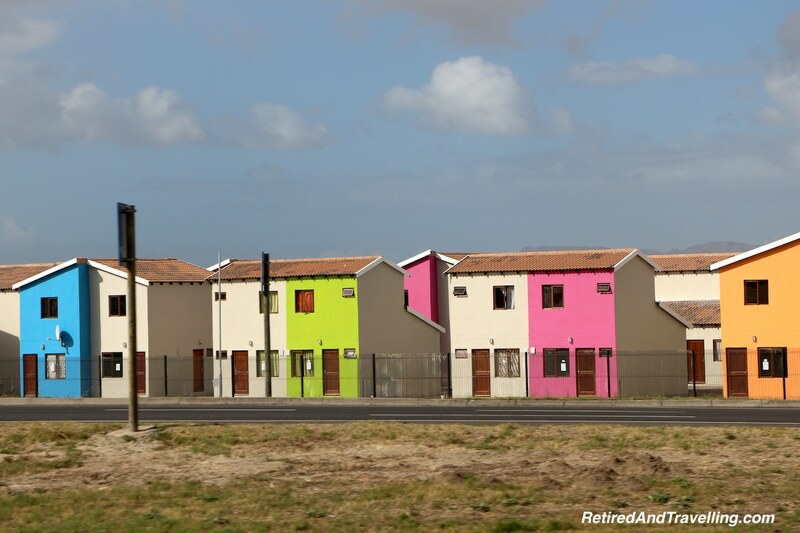 Over 60,000 of inhabitants of District 6 were forcibly removed during the 1970s by the apartheid regime. Today much of this area is empty fields. 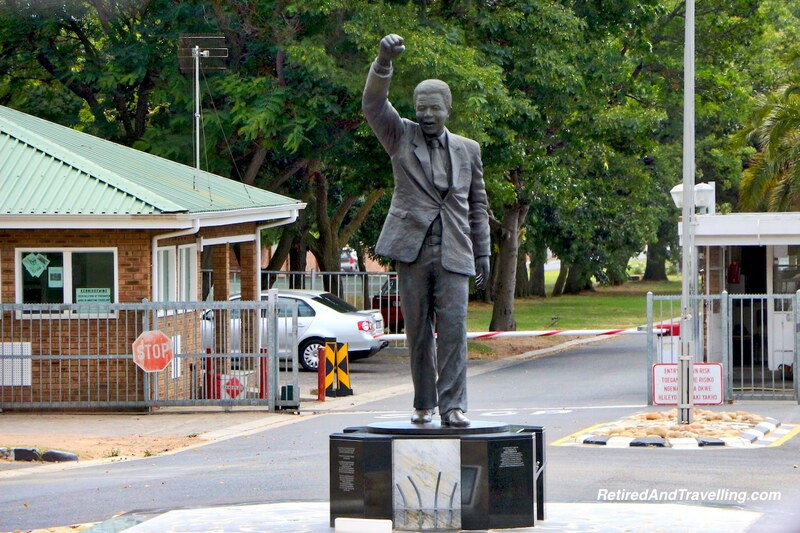 Throughout the 3 days of tours, we would learn about the history of South Africa both before and after Apartheid. 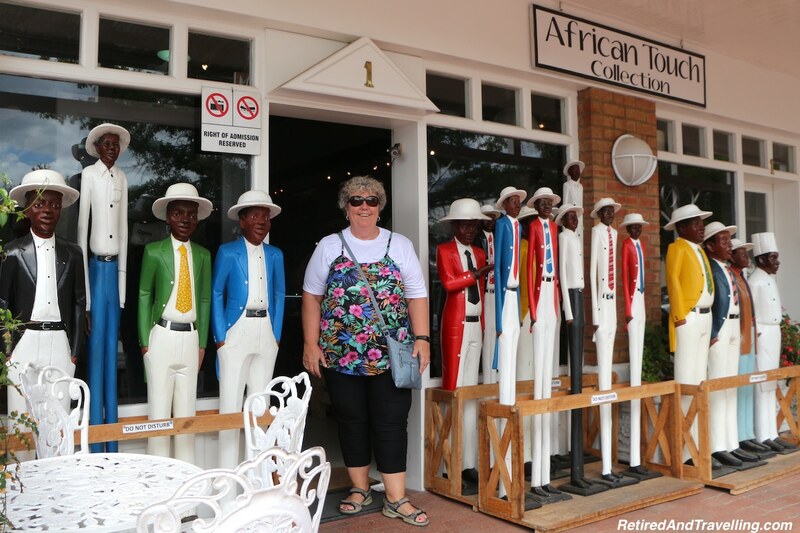 While there is no longer a legislated division between the races, it is clear that there is still a major economic division in many of the “townships”. We could see newer subdivisions in the outskirts of Cape Town. But the situation got worse as we got further from the city. 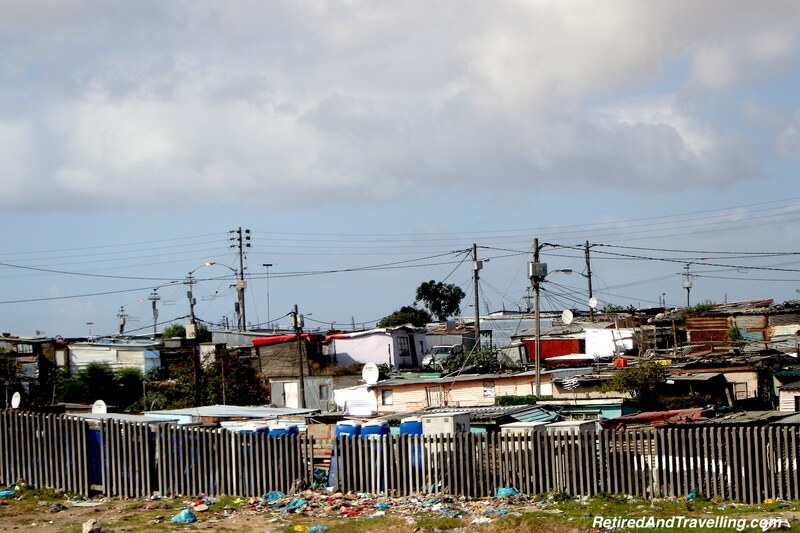 The shanty towns of migrants coming from poor rural area to the Cape Flats sprawled. Many lived in tiny corrugated buildings built on top of each other with no running water and shared outhouses. Crime in the townships is very high. Gangs often dominate these areas. When we passed the area of Langa, we were told there is 1 murder per day in this area. 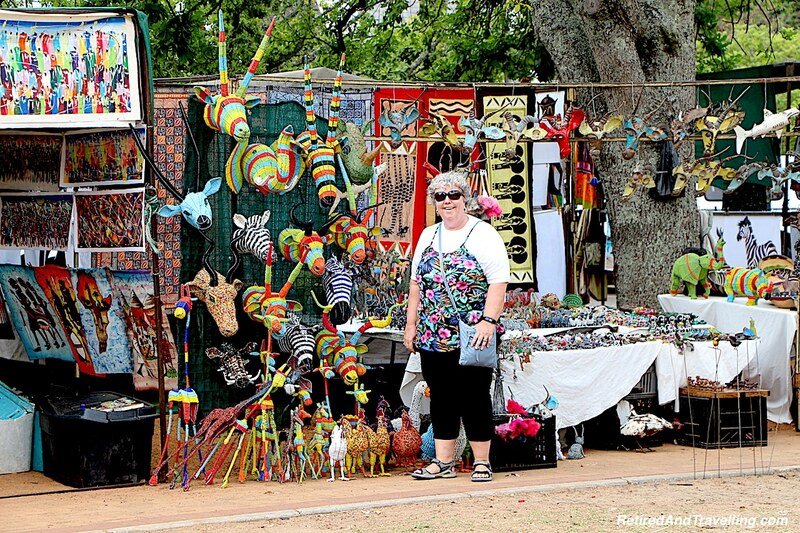 It was easy to see why there were so many tourist warnings about crime in South Africa. We drove through the countryside. The mountains were all around us. As we entered the large valley in the shadow of the mountains, it was clear that we were in wine country. 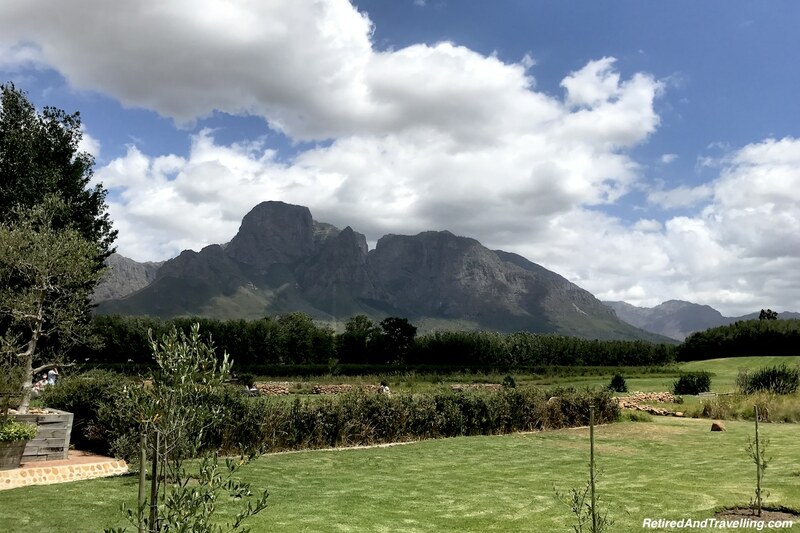 I have seen the wine region in the valley referred to as Stellenbosch, but there is actually is a small, quaint town of Stellenbosch. The bus did a quick tour around the town before letting us out to wander. David had been watching for coffee and chocolate and he knew right where he wanted to go. The BeBe Chocolaterie had a great selection of chocolate treats. 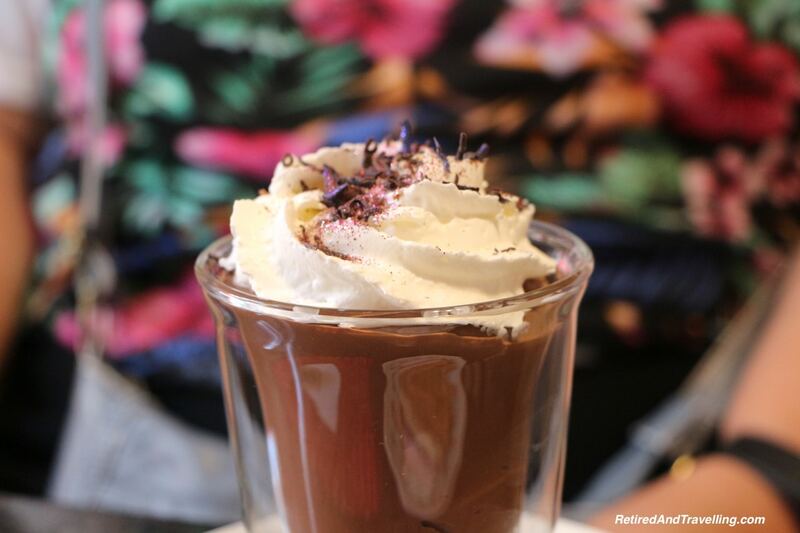 David’s cold drinking chocolate was like dark chocolate pudding and so rich that he could not even begin on his equally decadent chocolate brownie. It was a great stop to give us some energy. We wandered along the quaint main street, pausing occasionally to look at the local products for sale. 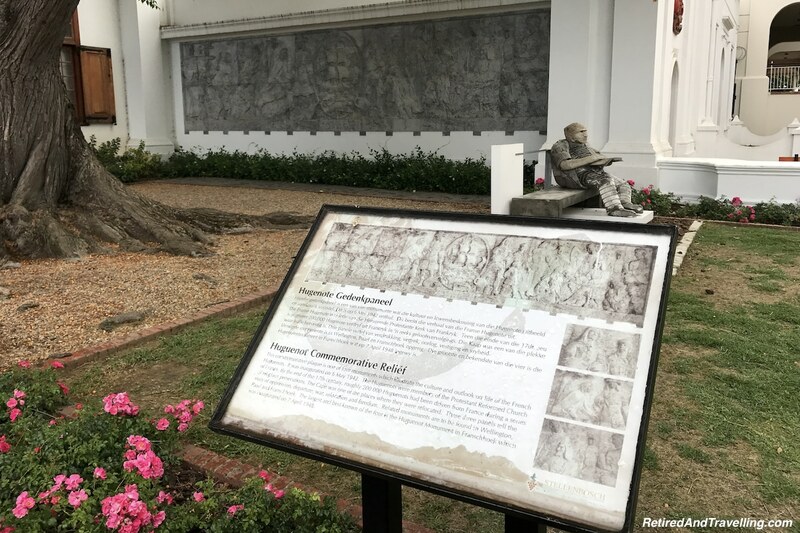 The Huguenot Commemorative Relief celebrated the early settlers to this region. We made sure we got a close look! 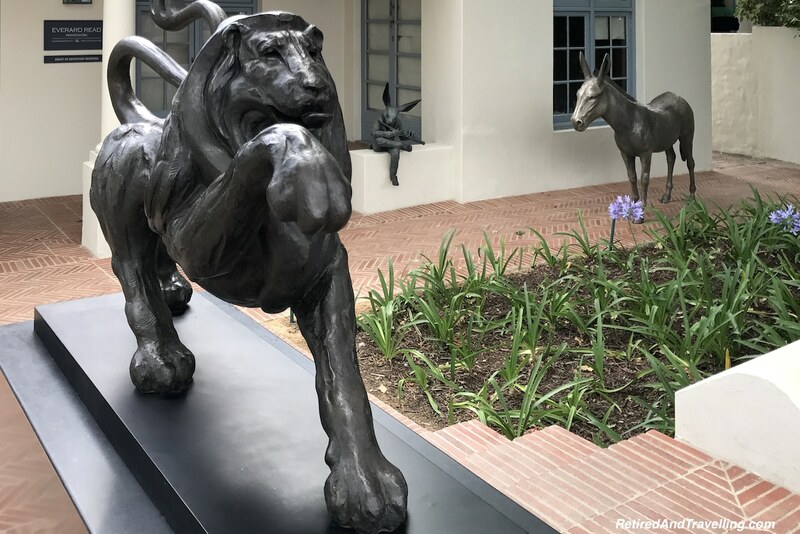 It seemed that there was art everywhere we looked. Some quite serious and other pieces quite playful. David couldn’t refuse to play too! 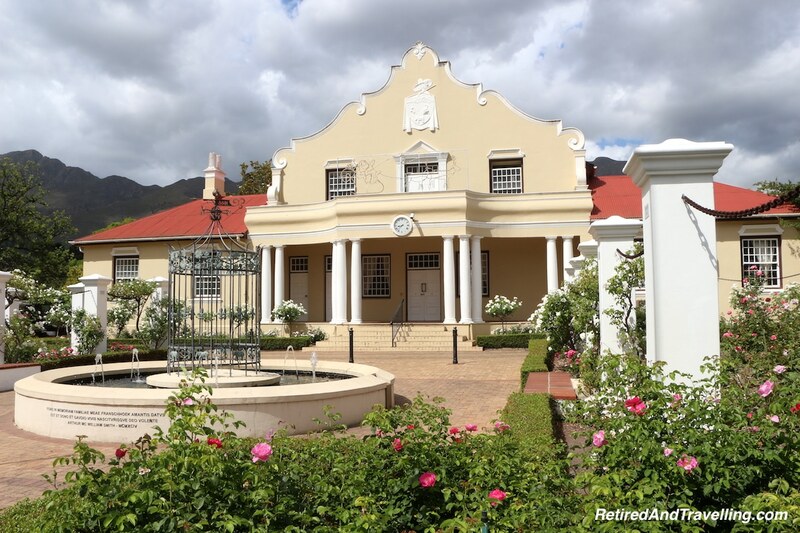 The second stop on our wine tour in Stellenbosch was at small town of Paarl. 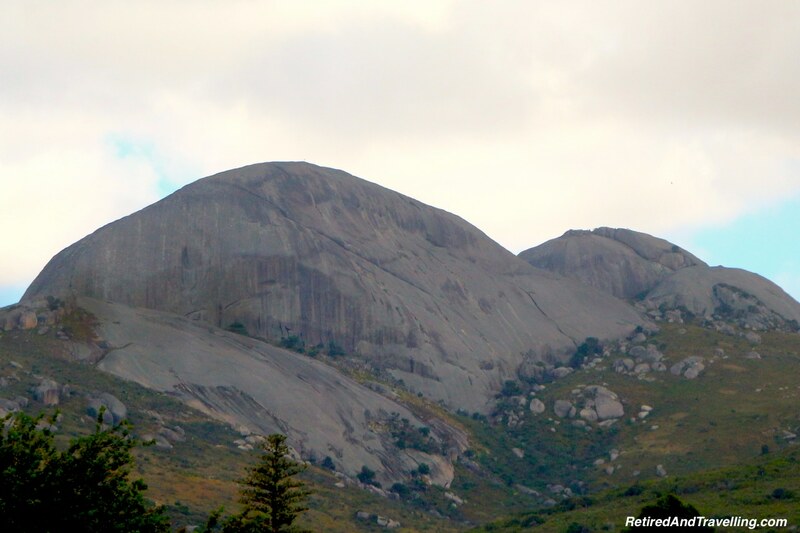 The town was named for named for the mountains behind the town with a granite outcropping that shone like pearls when it rained. 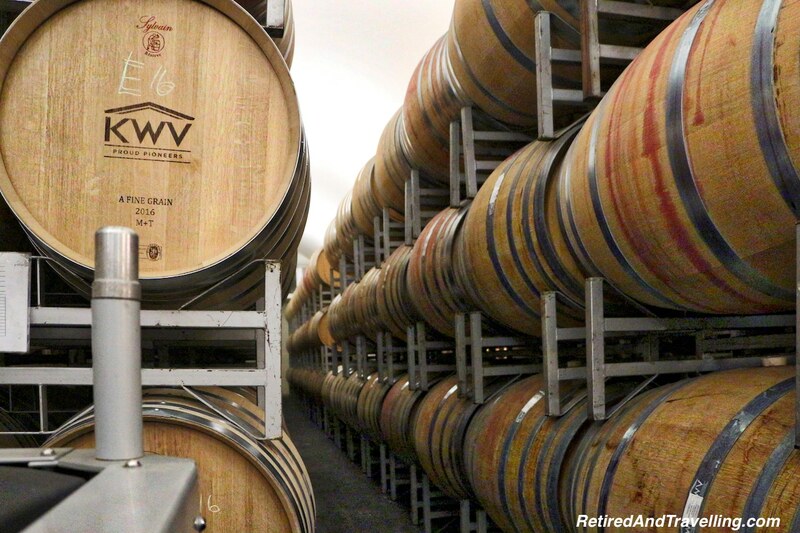 We visited the KWV Winery Cooperative for a tour through the factory. 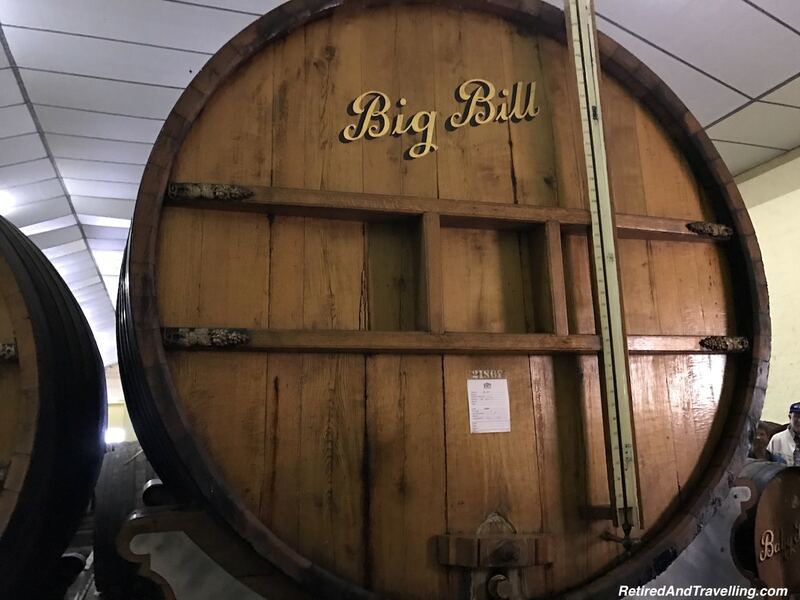 We saw one of the earliest massive wine barrels named “Big Bill”. Beside that we found “Mrs Bill” and “Little Bill”. 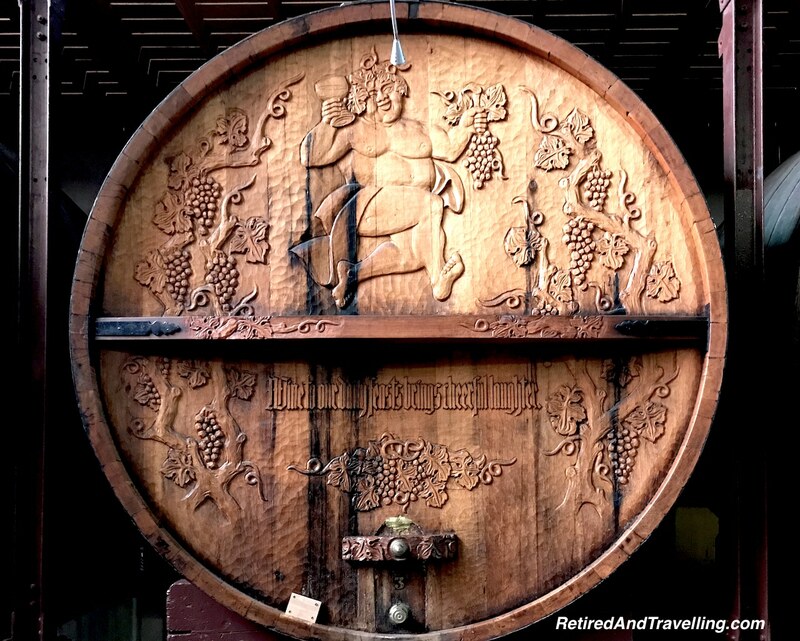 But this did not prepare us for the beautifully carved large wine barrels we found next. From there we walked through the rest of the factory. 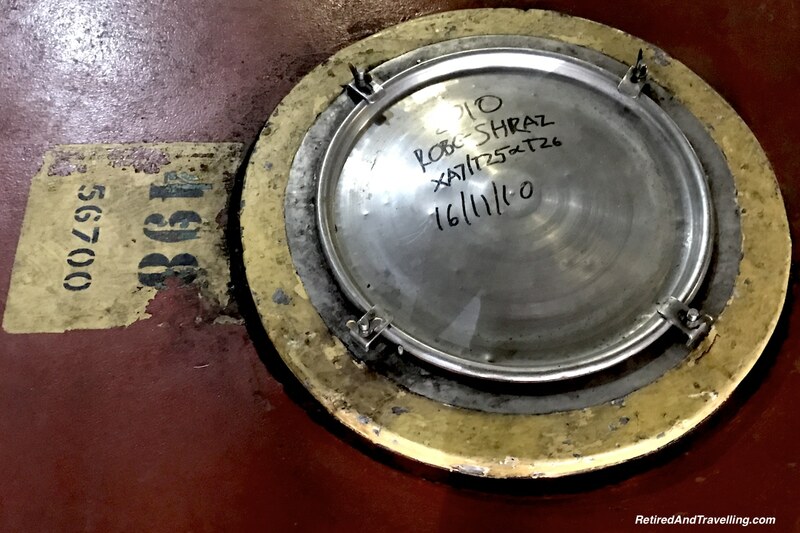 We saw various rooms with smaller wine barrels, the large stainless steel vats and the lids of vast stainless steel vats buried under the floor. 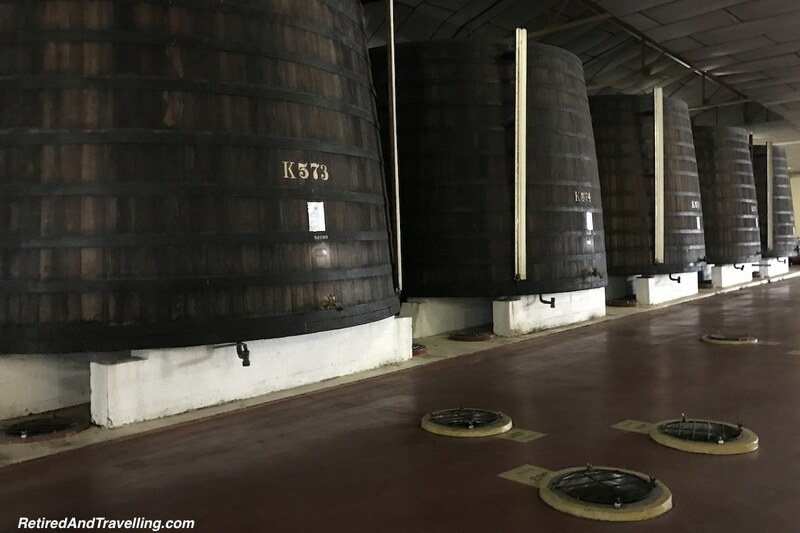 We learned a little about the production of local “port” (although it cannot be called port) and brandy. 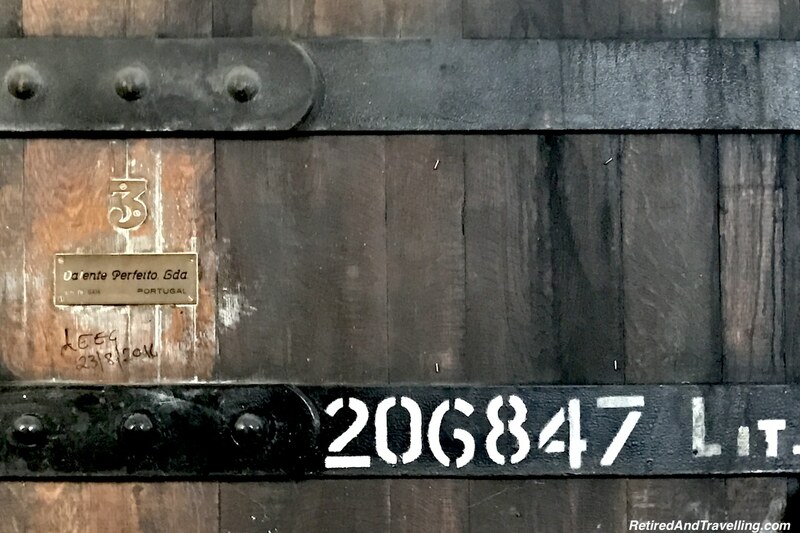 There was a display of ancient massive barrels that could hold over 206,000 litres. 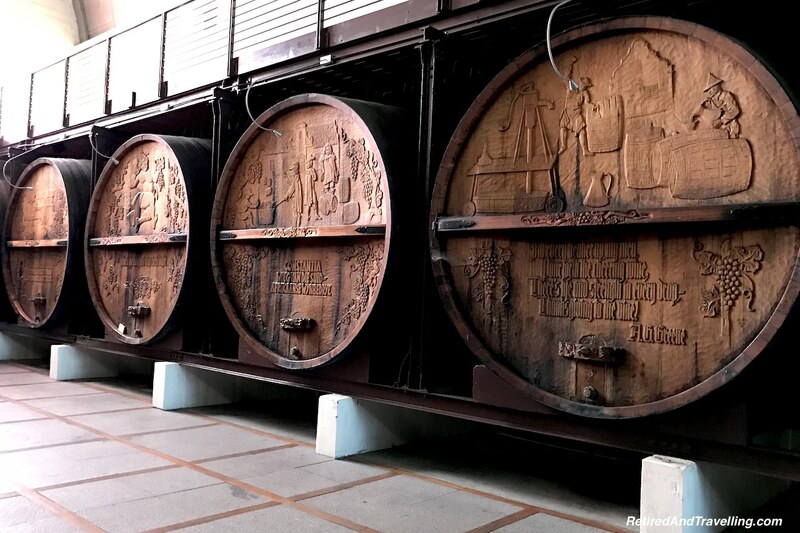 It was said that there was once a party held in one of these barrels when it was emptied. 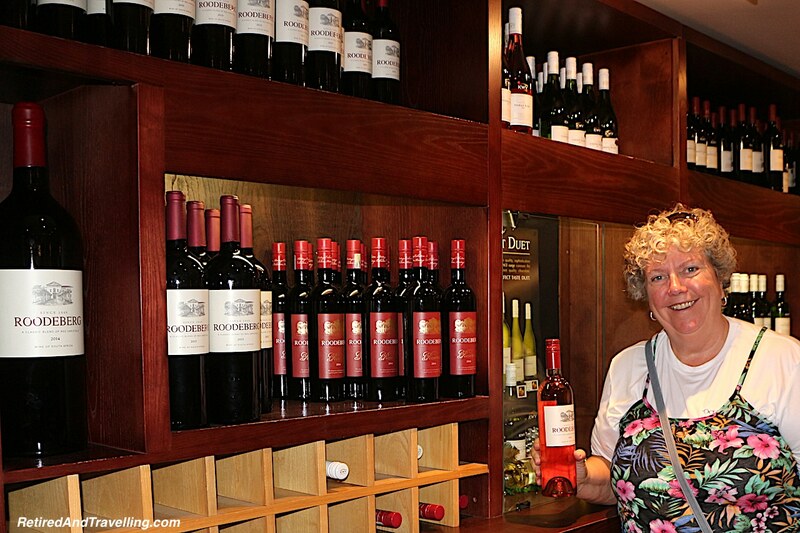 Of course, no wine tour in Stellenbosch is complete without a tasting. We got to try white and red wines, brandy and a local Wild Africa Cream liqueur. Then we were set loose in the store to load up our fridge! It was amazing how much cheaper this local wine was than wine at home in Canada! 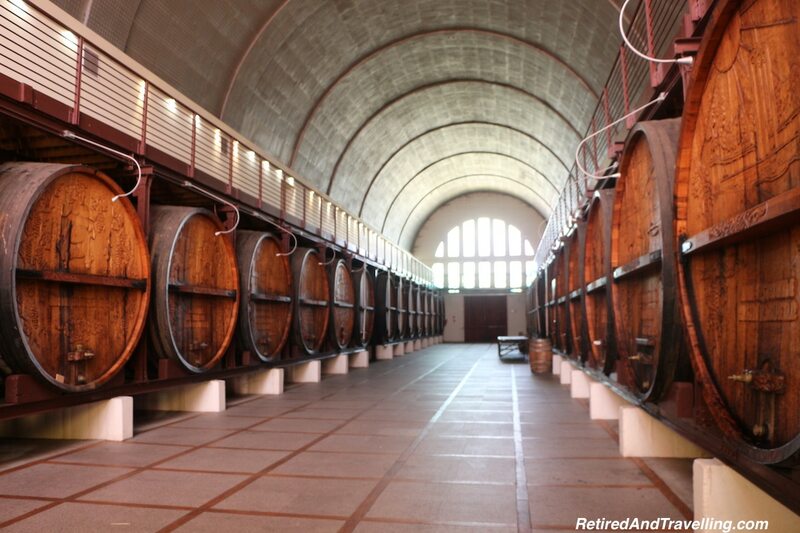 When doing a wine tour in Stellenbosch, make sure to plan lunch at a winery. A picnic lunch at the Boschendale Winery was next on our plan. But since we had seen rain on and off, the picnic was moved inside. 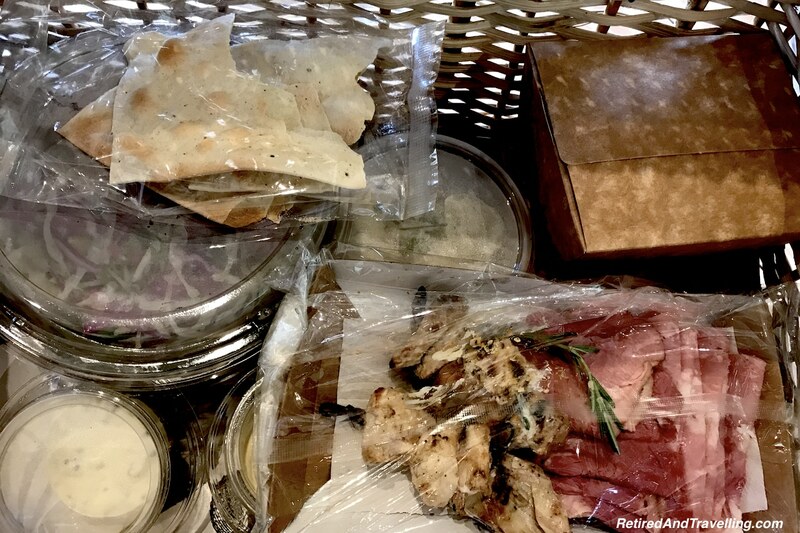 Big hampers full of food were delivered for each couple. As we dug to the bottom, we knew we would be taking the leftovers back to feed us for another meal. 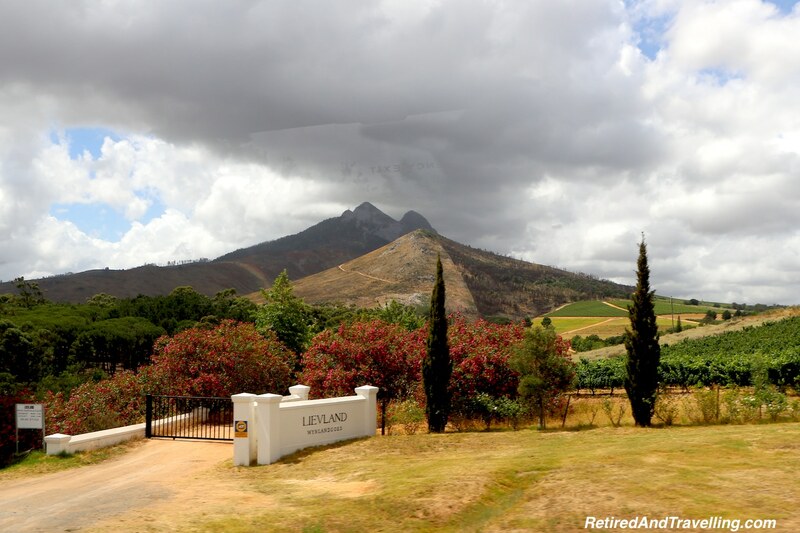 We were not finished visiting the small towns you find when you do a wine tour in Stellenbosch. 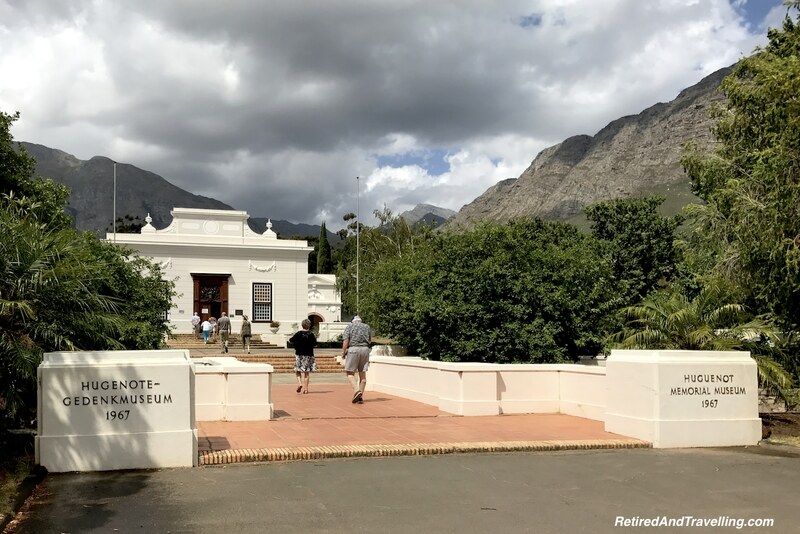 Our next stop was in the quaint little town of Franschhoek. 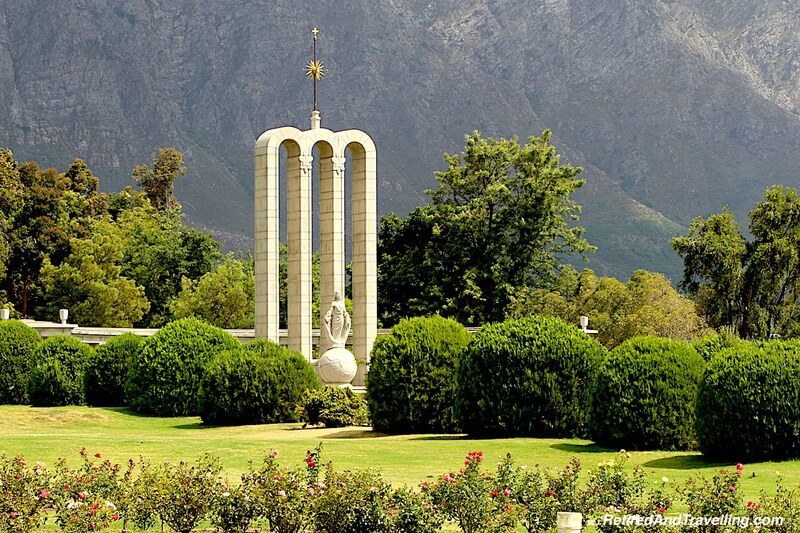 We drove along the main street and got out at the Huguenot Monument to the early settlers in the valley. We had only a short time before we needed to be back on the bus so we did not have time to go into the Huguenot Museum. David did manage to wander through the cemetery before we began out walk through town. 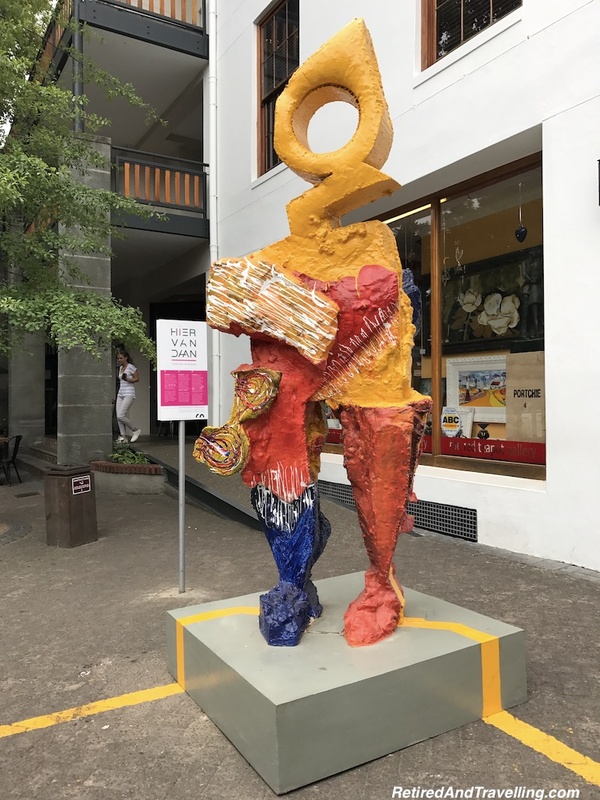 As we had found in the other small towns in this broad wine valley, there was art everywhere. 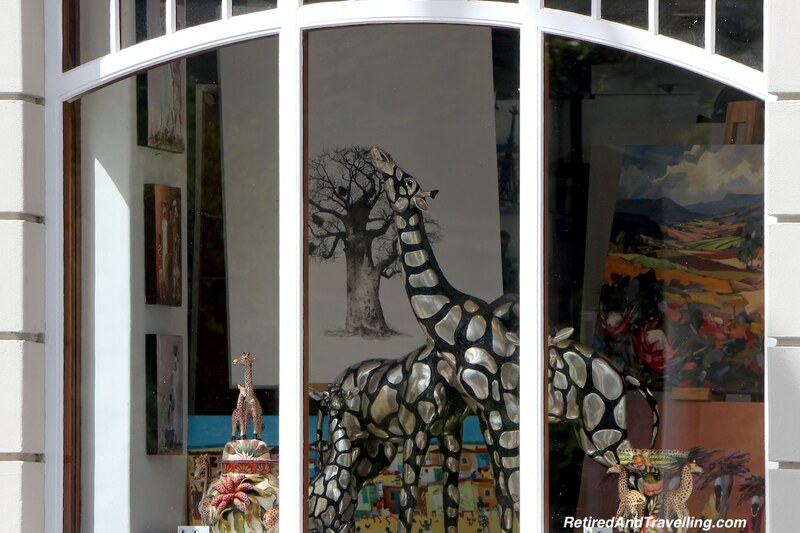 Whether it was in the small art galleries, for sale in the shops or just decorating the patios, we found lots to look at as we walked. 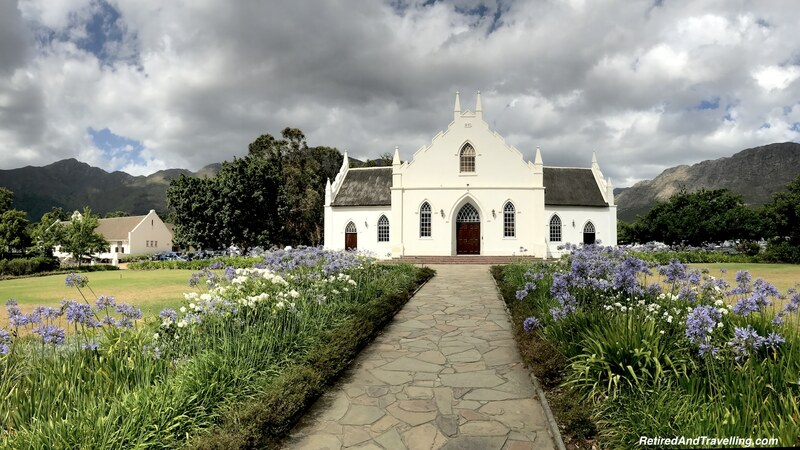 We walked back through town to the Dutch Reformed Church. While we waited for the bus, we strolled through the flea market looking at the arts and crafts for sale. We recalled the caution of our tour leader. Most of what we looked at was made in China! 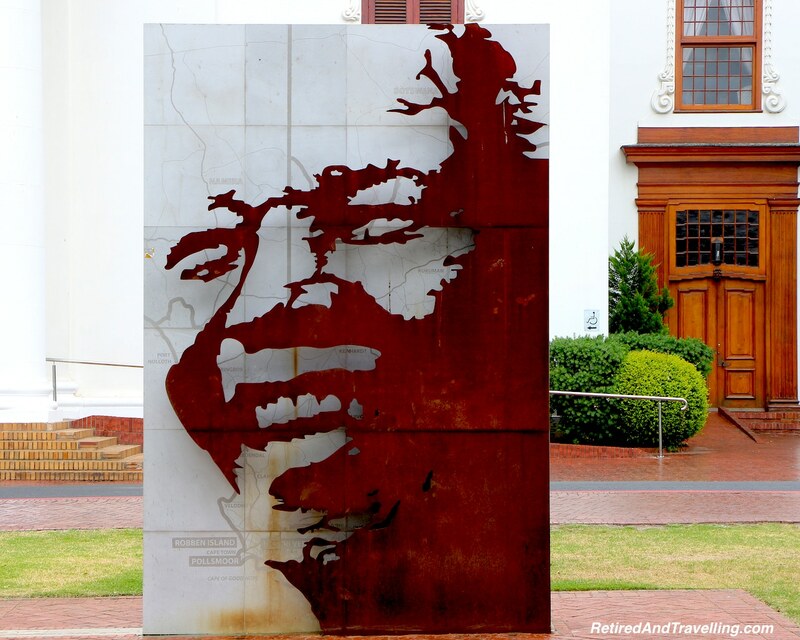 On our travel throughs through Cape Town for our wine tour in Stellenbosch, we would get constant reminders of Nelson Mandela. 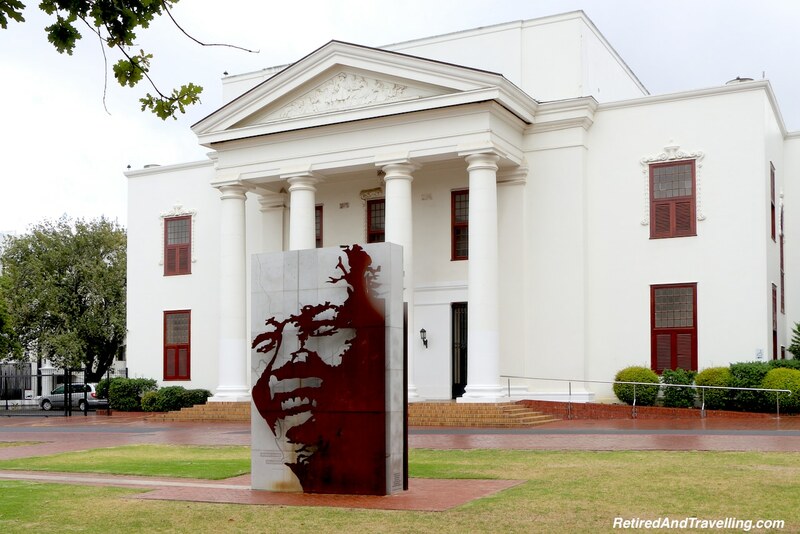 In the town of Stellenbosch, we found the artistic statue of the face of Nelson Mandela super-imposed on the map of Africa. We tried the view from different perspectives to make sure the face was visible. 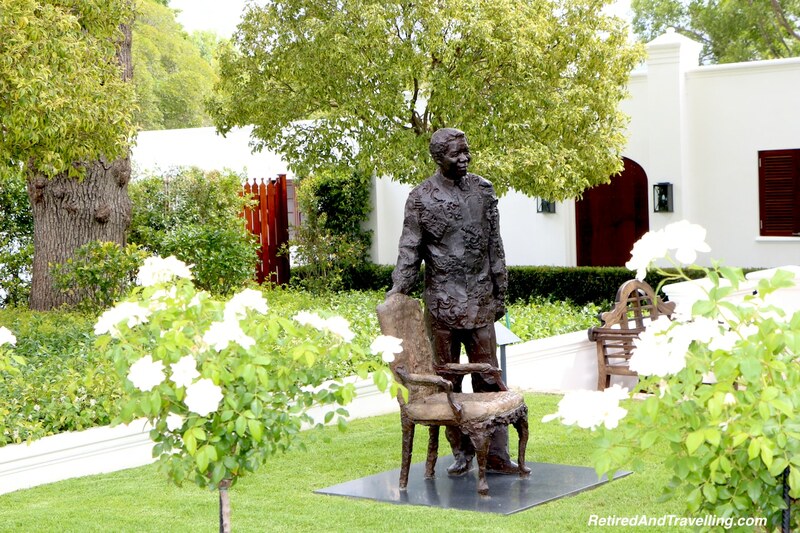 Wandering through Franschhoek, there were statues of Mandela in everyday life. On our return ride, the tour guide took us for a detour. 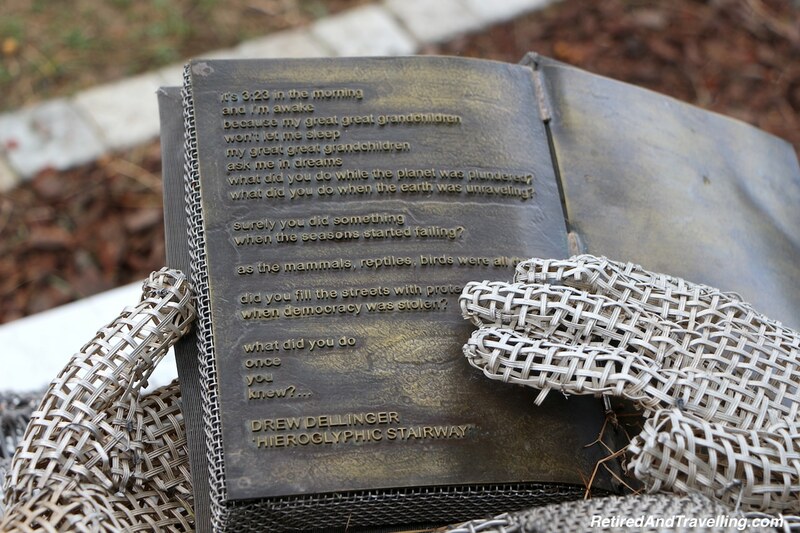 He wanted to show us the monument to Mandela’s release from Drakenstein Prison. This was just one of the many prisons in which Mandela was held over his 27 years incarceration. 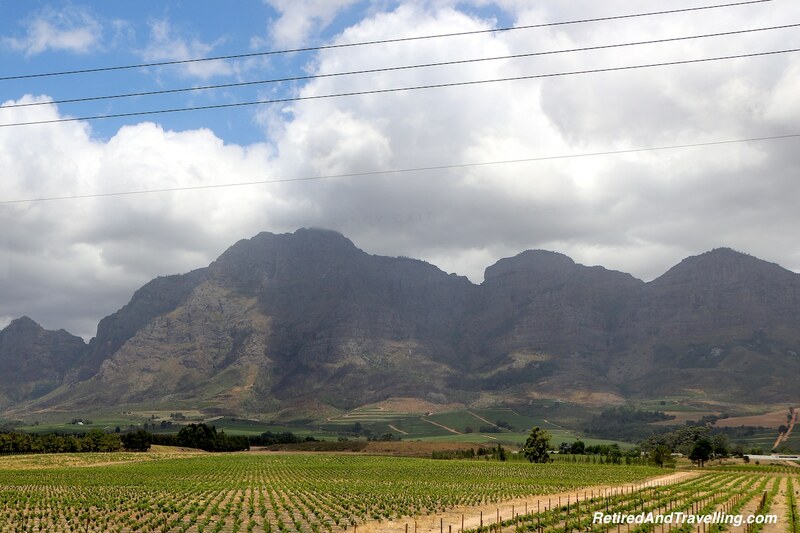 We only got a few small taste tests of this lovely wine valley region. The little touristy towns reminded us of Niagara on the Lake at home. It would be great to spend a few days poking around the towns. There were lots of hotels that looked lovely and quaint. And of course, there were so many wineries to try. As we had found when we did wine tours in Napa, there was a small “Wine Tram” that you could use to move from winery to winery. This would certainly increase the amount of sampling that could be safely done! 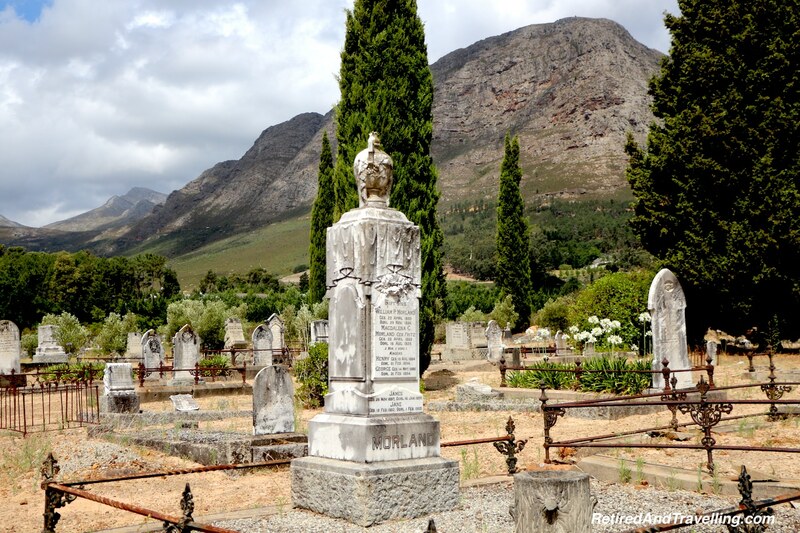 There is so much to do when you visit Cape Town. But you visit, make sure to get out in the country. 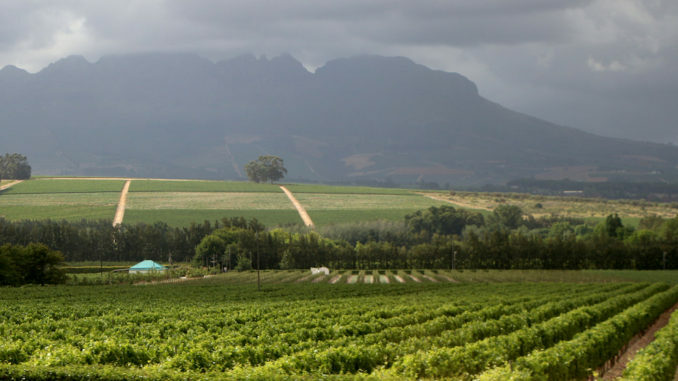 Don’t miss a wine tour in Stellenbosch. We would head through this wine region again the next day. 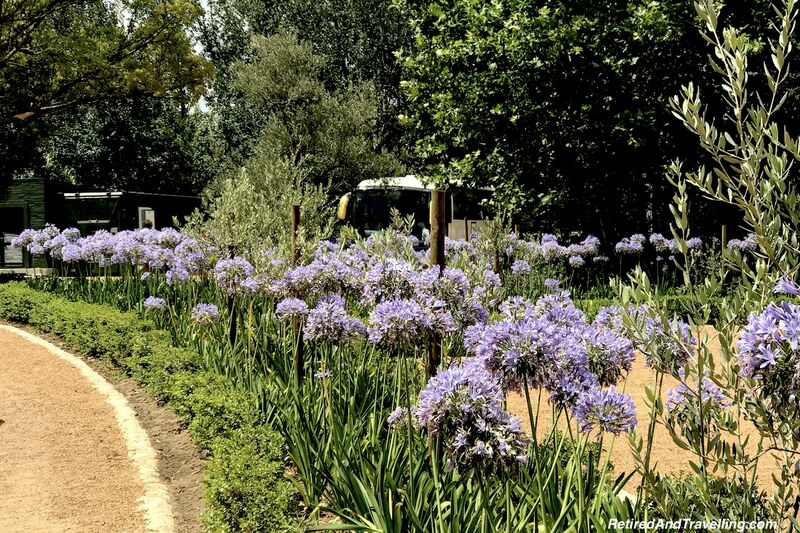 On the other side of the mountains we would find our next adventure at the Aquila Game Reserve! 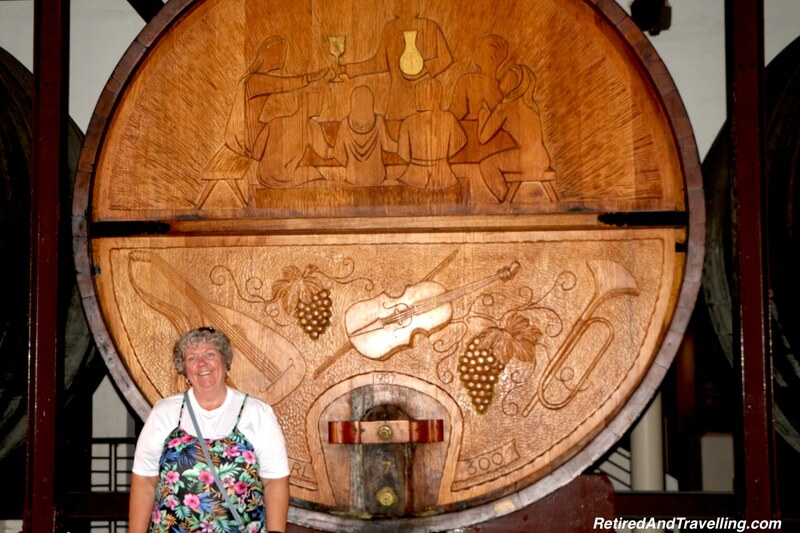 Did you start your wine tour in Stellenbosch? 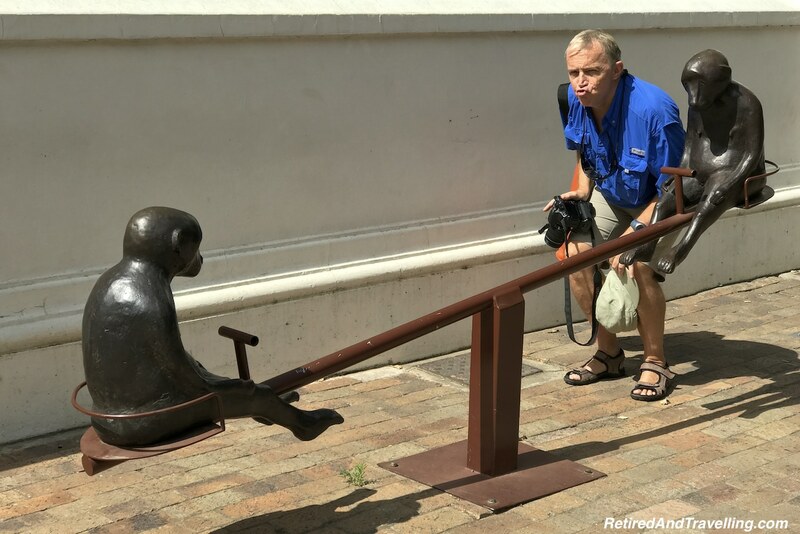 Did you visit for a day trip or spend more time?